The measure was an attempt to reign in what supporters say is unchecked presidential powers. 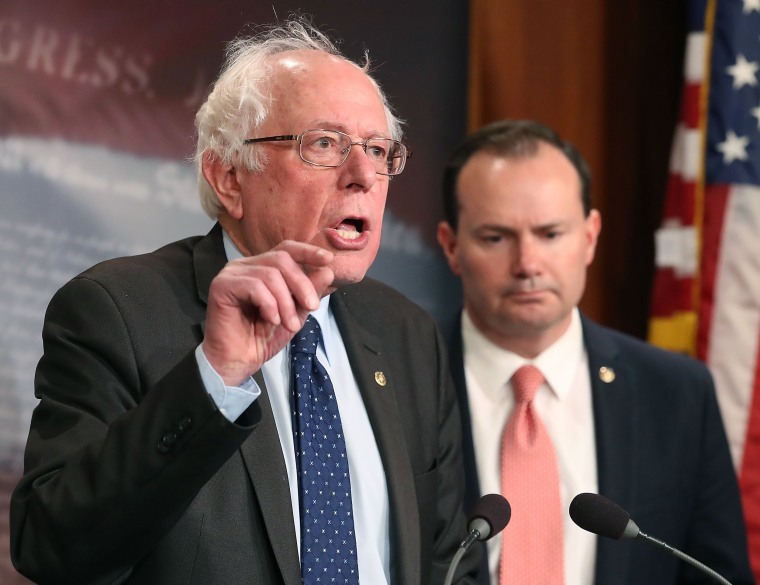 WASHINGTON — The Senate on Tuesday voted to defeat a war powers resolution for Yemen that represented an attempt to insert congressional oversight into U.S. military operations in the deadly civil war there. The measure, which called for the end of the U.S. role in the war, was co-sponsored by three members representing the full ideological spectrum of the Senate — Sens. Bernie Sanders, I-Vt., Mike Lee, R-Utah, and Chris Murphy, D-Conn. The Senate voted to block the resolution by a vote of 55-44. The measure was an attempt to rein in what its supporters say is unchecked presidential power in the use of military force. It would have forced the immediate withdraw of the U.S. from the area, except for purposes of fighting Al Qaeda, until Congress provides specific authorization. The vote came as Saudi Arabia’s Crown Prince Mohammad bin Salman was in Washington to meet with President Donald Trump. The U.S. is providing intelligence and reconnaissance support, as well as midair refueling, to Saudi Arabia in its fight on behalf of the Yemeni government against Iranian-backed Houthi rebels. The battle is considered a proxy fight among the U.S., Saudi Arabia and Iran with broader implications for the region. Sen. Bob Corker, R-Tenn., the chairman of the Senate Foreign Relations Committee, opposed the measure, saying the discussion was “tinged” with politicization because of the timing of the vote. For the first time on a war powers matter, the senators used a provision known as a privileged resolution that allowed them to force the measure despite objections. Corker announced that his committee would take up a new Authorization of Use of Military Force in his committee on April 19, saying that would be a better way to address congressional authority in war. The U.S. has been using the same war authorization to fight in overseas conflicts since 2001, which was passed in response to the Sept. 11 attacks and has been reauthorized several times since. “Withdrawing U.S. support would increase, not decrease, the risk of civilian casualties. And it would signal that we are not serious about containing Iran or its proxies,” McConnell said on the Senate floor. Yemen has devolved into one of the worst humanitarian crises in the world as more than 5,000 civilians have been killed and food aid has been unable to reach civilians. It is also experiencing the largest cholera outbreak in history. The U.S. military is currently investigating a botched U.S. raid Trump authorized just five days after his inauguration last year that resulted in the death of a Navy SEAL and a number of civilians, including women and children. A second resolution being discussed in the Foreign Relations Committee, proposed by Sens. Jeanne Shaheen, D-N.H., and Todd Young, R-Ind., is a pared-down alternative that expands the number of exemptions beyond just Al Qaeda. The House of Representatives overwhelmingly passed a nonbinding resolution in November condemning the U.S.’s involvement in Yemen, but efforts to pass a stronger measure that would force the president’s hand have gone nowhere.